Today more than two-thirds of consumers worldwide own a mobile phone, with figures surpassing the 5 billion mark in June 2017, according to GSMA data. Today more than two-thirds of consumers worldwide own a mobile phone, with figures surpassing the 5 billion mark in June 2017, according to GSMA data. For shoppers, a mobile phone is an integral part of their lives and they are keen to use its facilities – particularly when it comes to checking out food quality and traceability and winning prizes. The key theme of this year’s Consumer Goods Forum global summit, held in Singapore, was ‘Consumer Centricity in a Data Driven World’. Minister for trade and industry S. Iswaran spoke of Singapore’s Retail Industry Transformation Map, which encourages retailers to use innovative technologies to improve productivity and the in-store experience for shoppers and suggests all consumer goods businesses embrace data and technology to drive innovation. This year, a sales promotion pilot using individual QR codes on every SIG carton pack was trialled in southern Brazil by Languiru, one of the largest dairies from the state of Rio Grande do Sul, with some impressive results. 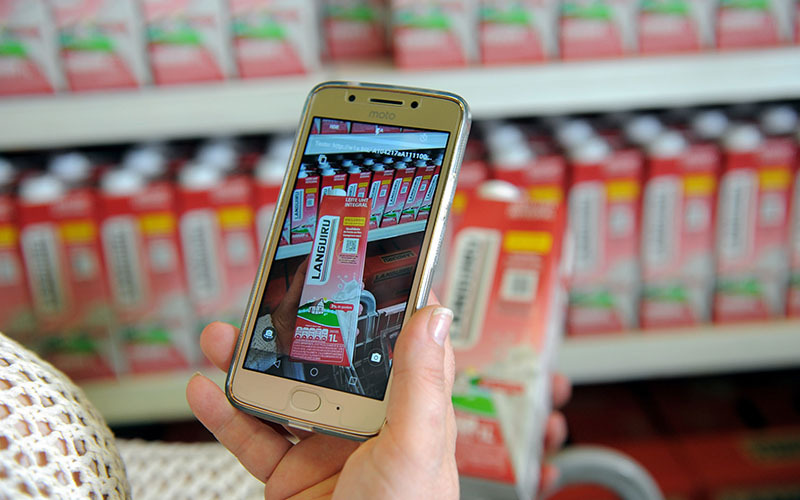 QR codes were used on all cartons of Languiru milk, including chocolate milk (Chocolan), with more than 12,000 codes generated every hour, connecting the consumer with product data via their smartphone. Consumers in store said it was easy to download the Languiru app, developed by SIG, and liked that the milk was from the local region. Their children were delighted with the emoji cushions they were able to redeem with the coupons and took them into school to show to their friends and teachers. Those shoppers buying the largest volume of milk gained the most cushions and they were extremely popular, leading to a 6 per cent growth in sales for this milk and chocolate milk brand. Prizes included bicycles, smartphones and shopping vouchers! Interestingly, 94 % of participants were android phone users and just 6 % apple users with 71 % of those using the code women, including 56 % in the 19 – 30 age group and 35 % in the 31 – 60 age group. Dirceu Bayer, President of Cooperativa Languiru, said: „SIG’s solution not only provides a 1:1 connection with our final consumers, but also opens up opportunities for tailored made raffle promotions with our retailer partners. The giveaway promotion ‘Bought, looked, won’ fully met expectations and improved our relationship with our customers. Through the use of this technology we can learn more about our consumers, providing valuable information for commercial and marketing teams“. Languiru’s latest digital promotion is the next stage in making best use of the integrated Connected Pack Solution, designed by SIG and Siemens, which collects product quality data at every stage of the product journey, from the beginning of industrialization process of the raw material to the supermarket shelf, and stores all information in one database. The dairy concept ‘Qualidade do inicio ao fim’, which translates as ‘Quality from beginning to end’, was the basis for Languiru to engage with consumers who can access all important data, from production dates to quality analysis. The QR code has become Languiru’s quality stamp, resonating in other products and categories within the portfolio. This builds on the established inline monitoring system and vast data collection, which ensures efficiency in both production and logistics. „QR codes on cartons mean our consumers are able to trace products from their industrialization right to the shelf,” said Euclides Andrade, Managing Director of Cooperativa Languiru. “Besides that, we benefit from detailed end-to-end value chain performance monitoring, which enables us to improve operations and logistics. SIG understood our demands and developed a tailor-made solution for Languiru that demonstrates our quality and adds value to our brand ». A further advantage of this new technology is that it is linked directly to the Languiru production lines. This maximises the dairy plant’s overall efficiency and cuts operational and investment costs by using a specific information intelligence tool known as Power BI. The power of a single QR code is substantial in enabling track and trace from plant to store shelf. SIG is ahead of the game when it comes to enabling a connected pack experience and can offer customised solutions, benefiting the consumer, manufacturer and retailer along the supply chain.